Patients may experience hair loss from chemical, tension, heat, trauma, illness, hormone changes or other types of reasons. After a thorough consultation, Dr. Jing Jing can recommend the best type of treatments available to address your specific type of hair loss. In our practice, hair loss is viewed in a step wise fashion. Minoxidil (Rogaine): is really the only FDA approved, over the counter, topical medication for Hair Loss. Traditionally, Minoxidil is suspended in an alcohol-based solution. So, even though it known to grow hair, when applied to African American types of hair (porous hair, chemically or heat-treated hair) this alcohol content tends to cause breakage, which in turn worsens the hair loss issue. To combat this issue, we have compounded our Miracle Serum 7 Minoxidil Suspension, which is 7% Minoxidil (higher than over than over the counter Men’s Extra Strength Rogaine), however this Minoxidil is NOT delivered in an alcohol medium. Instead, we mixed this Minoxidil with an Argan Oil, Cream Base thus producing a very smooth, silky textured, leave in conditioning treatment that will also help restore hair. Biotin: Biotin tablets can be helpful as well as prescription Propecia® (for men only). Platelets are powerful agents involved in wound healing and cellular growth. Currently there are numerous studies high-lighting the benefits of PRP in Hair Restoration. Patients are asked to present to our office well hydrated, and prior to their procedure, a small blood sample is taken and from this sample the patient’s platelet rich protein is harvested. This “liquid gold” fertilizer, is then placed back into the scalp by injection or via Collagen Induction Therapy. To ensure patient comfort, we numb the area being treated with anesthesia prior to treatment. Most patient report little to no down time for this procedure. Patients may enjoy LLLT at 830nm combined with other Laser therapies at therapeutic wavelengths for 30 minute sessions, twice weekly, for optional therapy results. These treatments are relaxing, pain-free, and have been proven to be effective. Please call our office today if we can help your Hair Loss issues. Often times patient chalk up their ITCHING, FLAKING SCALP to "I need to wash my hair more often." Washing one's hair excessively and using various over-the-counter anti-dandruff products may not be the solution. The true culprit may be an underlying infection or overgrowth of fungal organisms. The flaking scalp condition is also often accompanied by blocked pores of the forehead, jawline and face. Excessive blackheads, oily skin, with flaking in the eyebrows, ear lobes and nasal folds are also noted. 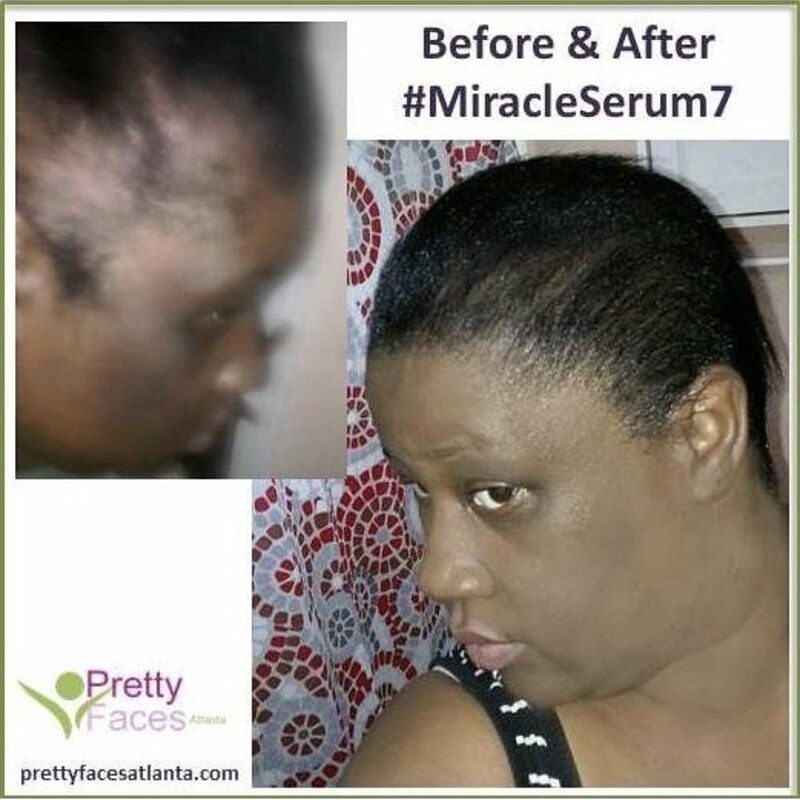 In severe cases, especially over extended time, and with superimposed "perming", coloring, heat treatment, and traction (braids, weaves), this scalp condition can lead to permanent hair loss. 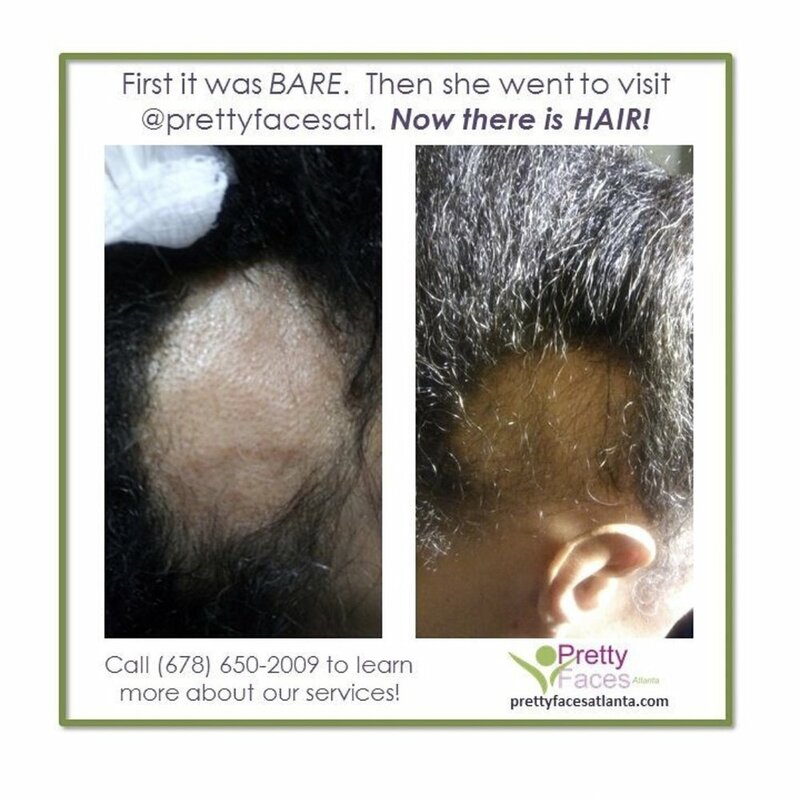 After consultation, The PFA Team can make recommendations to appropriately treat this MEDICAL CONDITION and alleviate your itchy flaking scalp and accompanying facial conditions. Please contact us at 678-650-2009 today for a consultation. Excessive unwanted hair growth can be treated! 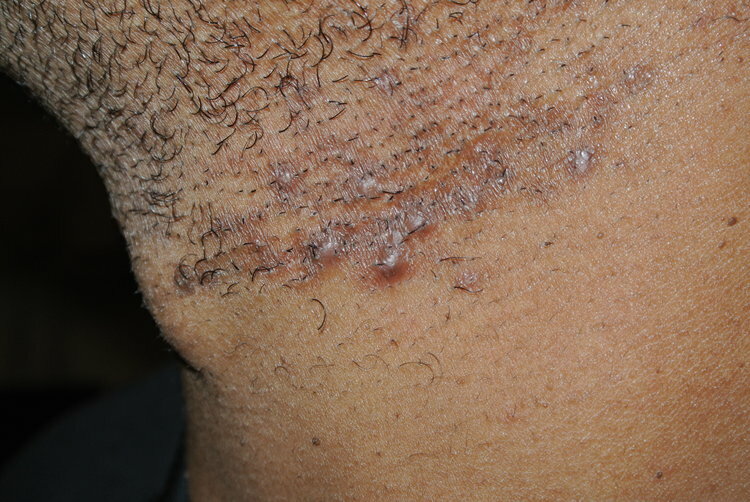 Pseudofolliculitis, also known as "ingrown hairs" or "Hair Bumps", is very common among pigmented patients, especially African American patients. "Hair bumps" whether of the face, neck, chin, groin, buttocks, or other places, can be very painful, tender, and unsightly. "Hair bumps" also often leave the affected areas full of skin "staining spots" or hyperpigmentations, even after the initial "bumps" resolve. Treatment for pseudofolliculitis is often just focused on the inflammatory process itself however unless the underlying issue is addressed, the patient tends to have recurrence, often in the same areas but also in other areas. In some patients, the inflammatory process of their "hair bumps" gets progressively worse, and in severe cases, these lesions can tunnel together under the skin and can cause massive skin inflammation, scarring and tissue damage. Pseudofolliculitis is a serious medical condition that should be treated and preventive measures should be discussed as well. We have designed specific treatments for Pseudofolliculitis (Hair Bumps) which not only treats the root cause but also alleviates pain, discomfort, and inflammation. These are treatments that WORK and are effective for both male and female patients.